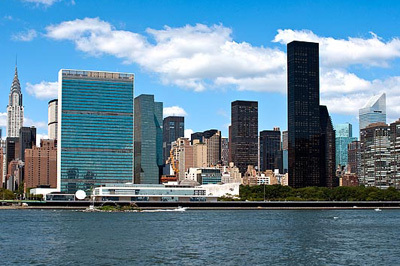 Trump Tower in shadow of United Nations, or is it the other way around? “also turned his attention to the United Nations, warning that it could meet a fate similar to NATO under a Trump administration. “By the way, United Nations — same thing, smaller numbers,” he said, seeming to call for a pared-down version of the intergovernmental organization. He sounds like the late, not-so-great, Senator Jesse Helms of North Carolina who loved to block payment of US dues to the UN. In Helms’ case it was because he objected to the UN distributing information on birth control. Both Helms and Trump seem to have a very petty view of the UN. Trump likes to think big, or huge, so let’s see how the United Nations has done on the biggest of all global issues since its inception. It gets an A+, because not only did 1945 mark the establishment of the United Nations, it also was the first and only year in which nuclear weapons were used in warfare. Perhaps it’s coincidence, or perhaps it’s cause and effect, but in the era of the United Nations, the world has been spared a nuclear holocaust. While there have been dozens of wars, including big ones like Korea, Vietnam, and on-going carnage in the Middle East, no country has resorted to using nuclear bombs. There is neither a shortage of nuclear weapons around the world nor countries that are in possession of them. But they alone have been silent for the past seventy-one years. The United Nations has also succeeded in doing what its predecessor, the League of Nations, could not do. It has played a role in preventing another world war. The League came into existence in 1920, right after World War I (then known as “The Great War”). However, the Treaty of Versailles that created both the League and dictated other terms of surrender following the war that planted the seeds for another even greater world war. In 1939, World War II exploded. The mission of the United Nations must be seen in conjunction with the generous terms of surrender that the world, and most particularly the United Nations, placed upon Germany and Japan following the Second World War. The UN knew that fomenting hatred was what had created that war and pacifying the world was key to limiting or diminishing the presence of war. Trump openly states that he is channeling the anger of others (and of course himself), and the distinction between anger and hatred is minimal. Trump’s criticism of the United Nations, as well as NATO, reflects several key lessons learned, and put into practice, following World War II. The best way to defuse hostile feelings among nations is through kindness. The United States’ Marshall Plan for Germany is perhaps the best example of this. And Mr. Trump, the United States has never asked Germany to pay back the expenses of the Marshall Plan. The fewer the number of nations that have large military forces (with nuclear weapons), the better. Following the war in the Pacific in World War II, the United States insisted that Japan spend no more than 1% of its GNP on the military. Japan has stood by that. Now Trump is suggesting that Japan and South Korea should develop nuclear weapons to protect themselves from North Korea and China. Trump seems to have been absent the day they talked about the benefits of a Pax Americana following World War II. Yes, the U.S. has not always been the best cop, but it has been successful in minimizing the re-militarization of other major nations. When the United Nations works best, it is when countries are willing to negotiate. Some may call that “the art of the deal.” Perhaps Trump should examine the United Nations a little more closely and learn more about “win-win” negotiations.